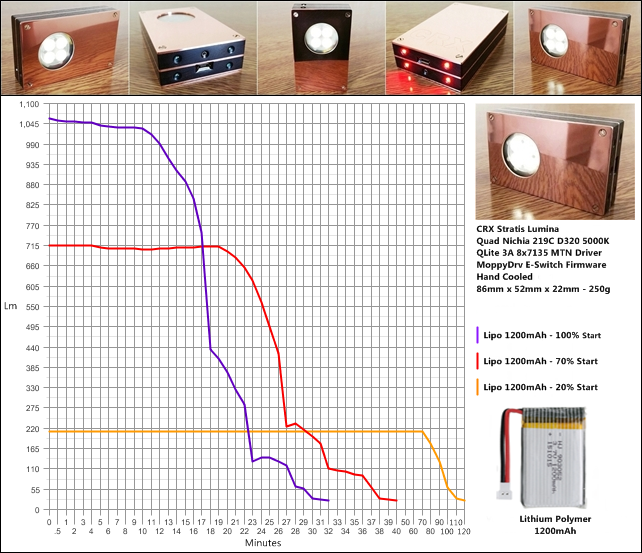 Hello and welcome to my build thread for the 2017 5th Annual BLF / Old Lumens Scratch Made Light Contest which is a competition where BLF members take part by making a flashlight or set thereof from scratch and was started by now deceased member Old Lumens who loved modding and making flashlights. There are two categories, Machine made and Hand made. Again I will be entering the hand made category and making the light(s) using only small hand held tools. 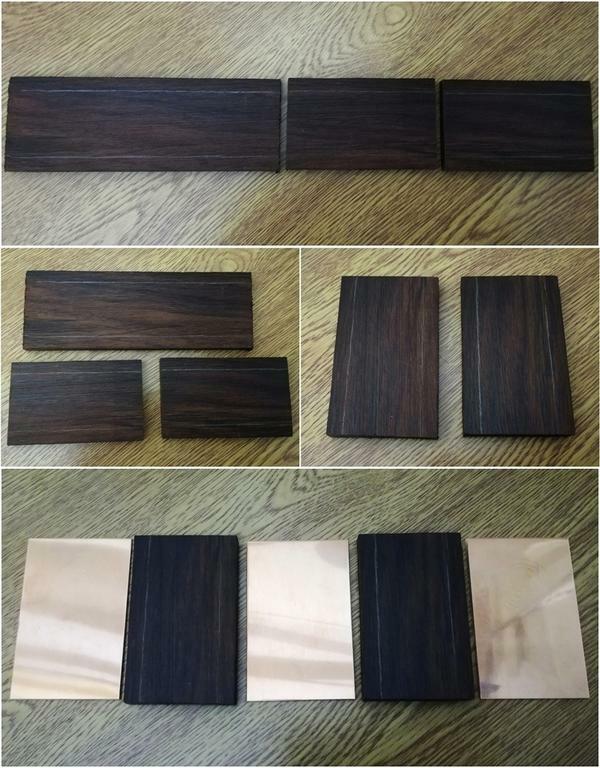 This years flashlight will be made from copper and wood, C101 1.2mm copper sheet and Indian rosewood. I have never worked with wood before so this should be an interesting experience. Incorporating alternating stratis of copper & wood and be similar in size to a credit card although a lot thicker. I have some stuff here but have ordered special materials for the body of the light and waiting for them to arrive, some members have no patience so I have made some images up with the concept I am planning. The light will be a quad emitter setup for the main lumina powered by a 17mm 105c 3A Nanjg driver and also have auxiliary red and UV emitters operated by a secondary momentary switch or mercury tilt switch so depending on how the light is positioned these will be on or off. The main driver will be a Nanjg 105c 3Amp with MoppyDrv firmware and operated via a blue tritium momentary switch on top. The light will be powered by a 1200mAh lithium polymer cell with a charger board built in and wired to a micro USB port. This light has three modes of operation, a tritium momentary locator switch on top for operating the main quad Nichia emitters via the Qlite 3A driver giving a sustained maximum of around 1092lm, a glow in the dark momentary switch for operating the eight UV front emitters and a mercury tilt switch which automatically turns on the four bottom red LED's when the light is placed faced down or thereabouts. This complementary light is much smaller in size for a more convenient carry and has two modes of operation with two momentary GITD locator switches on top, one for the front triple XP-G2 3D emitters giving a max output of about 392lm and one for the dual red LED's on the bottom of the light. The SL Micro is a fun light that can be worn on a neck chain for brief illumination periods and has a single mode of operation via a brass twist bolt on top which switches on the three front XP-G2 2B emitters for a maximum output of around 360lm and comes with a kydex carry clip & chain. Well here it is, going from my imagination to reality this has been a fun, educational and sometimes very difficult build but also a great learning experience. The CRX Stratis Lumina turned out fairly close to the original drawings I made up with the concept of having a front elevation the size of a credit card and I am happy with the outcome. The light performs very well, to my expectations with one of my favorite Nichia tints and the automatic red LED's for quick close range illumination when the use of the main array is not necessary. The UV is also a nice feature to have here. Looking back there are a couple of things I would have done slightly differently using other techniques but learning on these little creative journeys is half the reason I do it. The SL Mini can easily be slipped in a jeans side pocket and again has enough power to be useful along with the very nice 3D tint and night vision preserving red LED's. The SL Micro is just ridiculously small and fun for a rechargeable triple emitter hand made light and can be worn on a neck chain or kept in a pocket hardly noticed. As usual with me, this project started off as one idea then grew into a little family all cut from the same stuff. 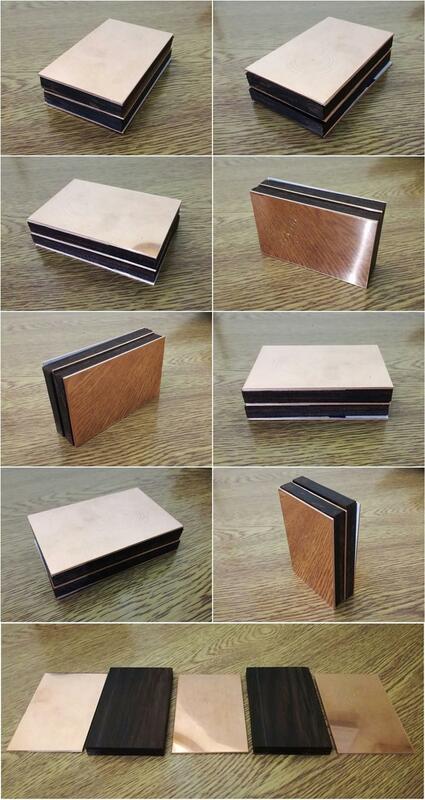 This is my original idea for how the light will be made using alternating layers of copper and wood. These images are measured, cropped and placed manually. Going from left to right = bottom to top sequence of layer assembly. Layers with the wood cut out. CRX Stratis Lumina should look something like this, all going to plan. Below are the build highlights, clicking on the images will take you to the respective post for more information. I like listening to music (and I use that term loosely ) when I build torches and have included some tracks in the various posts. Is it really, really small?? I’ll just put my glasses away then, Thanks for the update CRX. How can I get a credit card with my BLF name on it? Interesting, what emitters did you have in there? I was just planning on a low power 5mm UV emitter in the centre of the optic, probably 395nm or above as I noticed 365nm gets blocked by the plastic. I might also drill a centre hole in the optic but these decisions are made during the building. A nice wee delivery today means I can get started, a slab of copper, the rosewood and some bit's n' pieces. The Dalbergia latifolia has a purple hue to it which is interesting, goes well with the copper I thought. This piece is cut into a blank shape for making ukeulele/ mandolin fingerboards. Looks a lot like the Eye of Sekhmet flashlight from Silent Thunder Ordnance, but smaller! Shame Carclo doesn’t make a 40mm catadioptric optic. What’s wrong with the 60mm one? I’m sure with your skills, you could find a way to “fit” it to whatever you were going to use the 40mm one for. Maybe a nice “setting” like jewelers do with diamonds? Maybe could use it for a future build. Got the copper sheet cut into the rough shapes today. Each layer is about 1mm larger all round than required, to be made good and sanded down later. I also marked out where the glass, optic and MCPCB will be situated through the front piece using the digital calipers with one point held in the centre marking and the other point used to scribe the circles around. These circles will help to keep me right when taking out this material with a hand file. I will cut the rosewood next. I love copper. How thick? It’s 1.2mm thick, nice stuff. Measured and cut the wood, now got the rough pieces made up.